Six days after Black Friday, Mukul Pahuja and his now wife Alexis were driving down I-95, with Midtown Manhattan in their rearview mirror and the sunshine of South Florida beaming through the windshield. Pahuja was taking the plunge, following the footsteps of his older brother Vinny, who left Wall Street three years prior to become a professional poker player. There were emergency backup plans in place, and variance reared its ugly head to start, but in three years Pahuja has accrued more than $2.1 million in live tournament earnings. Now, with two stops remaining in Season XII, he is the leader in the World Poker Tour Player of the Year race. "Life is fantastic," Pahuja says, tossing a tennis ball down the hallway to his dog in a new home he and his wife purchased in August. "While I was deep at Bay 101, my buddy Jonas told me, 'I hope you never wake up from this dream.'" 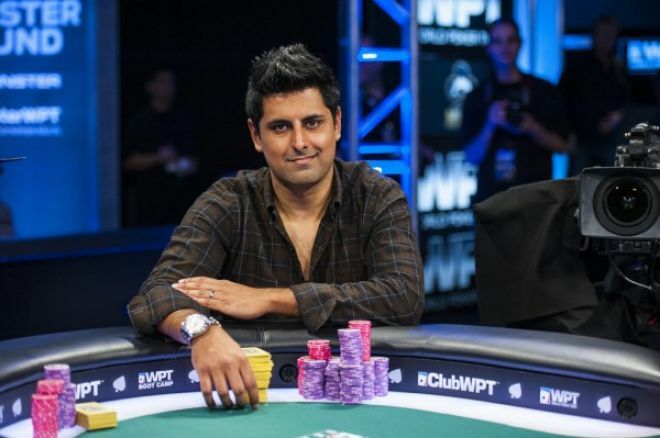 Not long after moving into his new home, Pahuja recorded the largest score of his career, finishing third in the Seminole Hard Rock Poker Open $10 Million Guarantee for $872,625. Three months later he finished runner-up in WPT Montreal, banking $362,430, and since the start of 2014 he’s added eighth- and fourth-place finishes in the WPT Lucky Hearts Poker Open and WPT Bay 101 Shooting Stars, respectively. "I have no right to complain about any bad beats of any sort," Pahuja admits. "No matter what happens with this Player of the Year race, my life is incredible and I’m extremely fortunate and appreciative of all of the success I’ve been able to conjure up." The $10 million guarantee was nearly a WPT-sponsored event — the first-ever WPT Alpha8 was held on property during the tournament and the penultimate event of this season is a sister-like $5 million guarantee at the Seminole Hard Rock — and if it was, Pahuja would’ve already locked up the most Player of the Year points in WPT history with 3,350. Matt Salsberg currently holds the record, racking up 2,575 points in Season XI. Pahuja believes there are several tough players still in contention, and anything can happen with two tournaments remaining. "If everyone who's really good at poker bricks the last two events, then awesome," he chuckles. "I need to go out and do something. Maybe I’ll just win Seminole Hard Rock." His hot start to 2014 also has him among poker's elite in the 2014 Global Poker Index Player of the Year race. Pahuja currently sits at No. 8, right above Team PokerStars Pro Eugene Katchalov, and while he calls the ranking a "big surprise," he’s not going to go out of his way to take any shots in $100,000 buy-in tournaments. "I'm happy spending time at home, being a newlywed," Pahuja says. "We just installed a pool. I'm ecstatic about the life we've built for ourselves. When a good spot comes along, I'll go, but the other stuff takes priority." Pahuja assumed great risk leaving the finance industry when he did. The market was in decline after the U.S. banking crisis of 2008, and it was incredibly difficult for even the most experienced workers to find employment. He spent four years at Penn State University studying finance rather than grinding online — he did spare some time for a few sit-n-gos here and there — and upon graduating he became a junior trader. He soon realized that it was going to be difficult to have his own book on Wall Street, so he switched gears and took a position at Bank of America as support to the fixed income trading desk on the floor. Vinny’s success in finance lured Mukul to Midtown, but his older brother quit a sales position at Lehman Brothers to pursue poker full time. In his first two years as a professional, he earned just under $800,000. Mukul’s love for poker grew while his interests in finances decreased. Every weekend, every sick day, and every vacation day was spent grinding. After work on a Friday, he would catch the Port Authority bus to Atlantic City or Foxwoods to play in a tournament series or cash games, and during the summer he used vacation days to travel to Las Vegas for the World Series of Poker. At the end of 2009, Pahuja finished fourth in the $5,000 World Series of Poker Circuit Harrah’s Atlantic City Main Event for $73,347. Three days later, he used a sick day to play in a $2,000 buy-in post-lim, and won, pocketing $51,169. Pahuja said it took a full year of "loathing his job" in 2010 to finally push him out the door, but he knew right then, after having a six-figure week in Atlantic City, that this was something he needed to pursue seriously. "It was a tough decision — probably tougher than people would imagine," Pahuja reflects. "My focus and my upbringing was based upon good grades and doing well in school. If I didn’t have an older brother who was really successful, it would’ve been tough to approach my parents." As the year came to a close, Mukul and Alexis started researching possible destinations. Florida fit the bill because of its warm climate — New York was hit with a big blizzard in December of 2010 — the Sunshine State was experiencing a small poker boom, and there is no state income tax. Concurrently, Pahuja hinted to his closest friend at work, and the person who would be affected the most by his absence, and his manager that he would likely be leaving BOA. During the first few months of 2011, Pahuja secured his bonuses, and then immediately gave the company his two-week notice. The only problem was that the WSOP Circuit was coming to Atlantic City one week after Pahuja received his bonuses. "I told them I need to go do this. This is my job now," Pahuja says. "I have to go play these tournaments." Pahuja bargained with his superiors, telling them he would work for up to four extra weeks to help them during the transition if he could take the vacation time to play in the tournament. They obliged, and Pahuja headed to South Jersey, where he finished 18th in the Main Event for $7,280. "My buddy Adam Lippert got me," Pahuja recalls. The next few months were disappointing for Pahuja. His initial plans were to play online poker and live cash in Florida, but Black Friday halted him from grinding on the virtual felt. "I literally had computer monitors in my Amazon shopping cart," Pahuja jokes. "I was expecting to put in a ton of volume online." 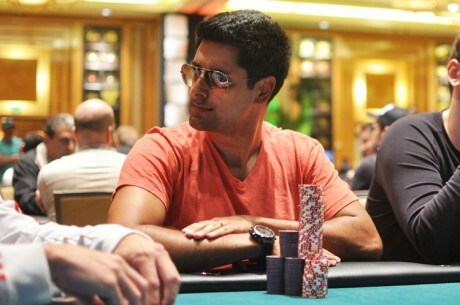 Pahuja considers himself a "fish" online, and hasn’t reinstated his online poker accounts. Had he played online in college, he believes he could’ve registered over a million hands, but he has absolutely no regrets about his college experience. "I have a lot of work to do on there," he admits. "I'm going to take humongous strides in order to become decent at online poker, but I wouldn't trade my four years at Penn State for anything, much less a million hands of poker." During his first few months in Florida, Pahuja shifted his attention to tournaments, but he only cashed twice before the WSOP. He failed to register a single cash in a bracelet event, but did reach the final table of a Deep Stack Extravaganza tournament at the Venetian. Things picked up at the end of July when Pahuja finished fourth in the Florida State Poker Championship for $92,050. It was the largest score of his career at the time. In 2012, he cashed for a total of $207,943, and he was on pace to match that number in 2013 before he made the final table of the $10 million guarantee. Now he’s living the dream, and never wants to wake up. Season XII of the WPT concludes at Borgata Hotel Casino & Spa, with the $15,000 WPT World Championship. Borgata played a huge role in Pahuja's development as a poker player, and he's excited to return to his old stomping grounds. "When the WPT was in town, I always made it a point to drop everything and play," he says. "I played the first $3,500 WPT Main Event I could when I turned 21." If Pahuja retains his lead and is crowned Player of the Year, it would all come full circle.